As expected, we’ve seen a week of absolute adulation in the media and mainstream “cult”ure over George H.W. Bush. We should choose our heroes more wisely. “Bush dirty tricks,” as Ross Perot once called them, go back at least to H.W’s father, Prescott and probably before. Not all conspiracy theories are false. Digging into the Bush family’s past, as many researchers have, yields a plethora of simply fascinating facts that belie the grandfatherly figure portrayed during services last week. They show a man that grew up in a family already hanging on to the fringes of the truly powerful in America by early in the 20th Century. Almost anywhere there’s conspiracy or duplicity, oddly enough, you find the Bush name tied to it. Yet, they skate free and go on to serve in high offices, get 21-gun salutes, flags hung at half-mast, and the media falling all over themselves to shower them with love. After all, they’re not that evil Donald Trump. I brought up a few such instances in the article I published last week. At that time, I left out the prequel and I’ve come across some additional interesting information about The Bay of Pigs and the Kennedy Assassination. Some of the biggest monied interests in The United States of America formed an organization called the American Liberty League. They formulated a plan to ask FDR, as one “of their class,” to step aside or face a forceful coup. What? You never heard about that? Much of it was classified for decades afterwards and has only come out in Freedom of Information Act requests slowly over time. 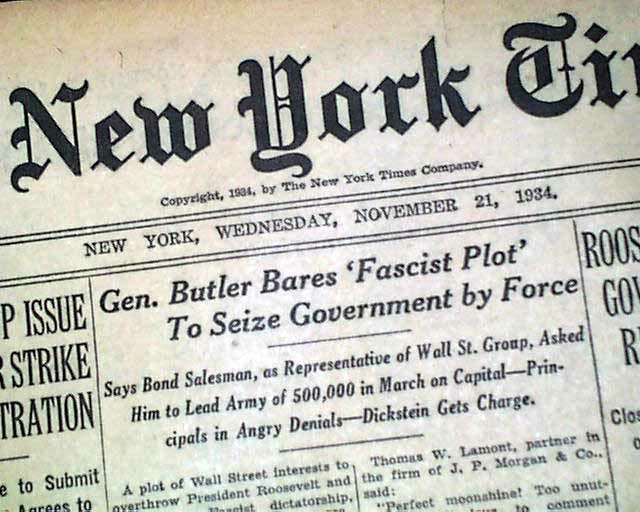 The plan never got off the ground, but it was exposed before a Congressional committee - the McCormack-Dickstein Committee by Marine Major General Smedley Butler. Butler was immensely popular World War I veterans who faced massive unemployment after The Great War. These monied interests offered to make Butler the military leader after the coup, run of the shadows, of course, by them. This NPR audio from 2012 details the plan, but shares none of the names. It also tries to turn the story into a case of anti-semitism. This CounterPunch article from 2011 does name names. The committee found no reason not to believe him. Because he was a two-time medal of honor winner and very popular, the powerful players he named didn’t come after him directly. Instead, the media went on a campaign to discredit Butler as a naive dupe. He was eventually relegated to the historical heap of conspiracy theorists. What does this have to do with the Bushes? The CounterPunch article, I highly recommend you read it, details it. Here’s an excerpt. The (American Liberty) League was headed by the DuPont and J.P Morgan cartels and had major support from Andrew Mellon Associates, Pew (Sun Oil & Pew Research), Rockefeller Associates, E.F. Hutton Associates, U.S. Steel, General Motors, Chase, Standard Oil and Goodyear Tires. Money was funneled thru the (not-yet) Sen. Prescott Bush-led Union Banking Corporation (yes, those Bushes) and the Prescott Bush-led Brown Brothers Harriman (yes, that Harriman) to the League (and to Hitler, but that’s another story). The plotters bragged about Bush’s Hitler connections and even claimed that Germany had promised Bush that it would provide materiel for the coup. At the time, GM’s wholly-owned Adam-Opal Co. had already begun producing the Nazi’s tanks, trucks and bomber engines. James D. Mooney, GM’s vice-president for foreign operations was joined by Henry Ford and IBM chief Tom Watson in receiving the Grand Cross of the German Eagle from Hitler for their considerable efforts on behalf of the Third Reich. In October of that year, the company is seized by the US Government and held until the end of the war. The bank was tacitly under the control of Fritz Thyssen. Thyssen, though he later rejected the Nazi Party after Kristallnacht, had been a major funder in the growth Nazism in Germany. His iron works helped build the German war machine. He was, however, one of seven directors of the bank (along with Averell Harriman). Now, Bush apologists have argued that Thyssen had already turned his back on Hitler by 1942. Further, they claim that Thyssen only indirectly owned the bank through a Dutch subsidiary and that Prescott owned only one share out of 4000. His father-in-law George Herbert Walker founded the bank in 1924. Prescott was a past president of the bank. He was also a partner at Brown Brothers Harriman - the privately-held Wall Street banking firm. In the big scheme of things, Bush and Harriman were low-level hangers-ons to bigger money American and British interests that helped fund those who funded Hitler. However, their claim that their titles were honorary and they had no knowledge of the bank’s dealings is scurrilous. No charges came against either Skull and Bones member and they went on to play huge roles in US government over the coming two decades. A book could be written on this and books have been. However, let’s move forward to 1953. Prescott Bush is now a senator from Connecticut. Harriman had already made his first of two unsuccessful runs for president and had served as Secretary of Commerce, and become part of “The Wise Men” - a group of wise elders on foreign policy. Questions about their trading with the enemy activities are a distant memory and never even come up during Bush’s candidacy for the senate nor Harriman’s primary run for president. Prescott’s son, George Herbert Walker Bush (the future president) moves his young family to Texas and forms the Zapata Oil Company. Sadly, he didn’t know anyone important to help him set up the company… except Allen Dulles, (fellow bonesman and Chairman at Dresser Industries later Haliburton) H. Neil Mallon, Bush’s uncle Herbert Walker, and Washington Post Owner and Former Federal Reserve Chairman Eugene Meyer (I guess the WAPO CIA connection goes back much further than we thought). Bush also hired Thomas J. Devine - a CIA operative who supposedly left the agency, but was later shown in declassified documents to have been using it as a CIA commercial cover. The young company formed an off-shore subsidiary that had interests in the Caribbean Sea near Cuba. According to the book Family of Secrets published in 2008, Zapata filed the appropriate paperwork for the Securities and Exchange Commission (SEC) between 1954 and 1959. However, records from 1960-1966 are missing. The record picks up again in 1967. Barron’s Magazine investigated this and was told the files were inadvertently destroyed either in 1981 or 1983 as part of a purge of boxes from warehouse where they were stored. Rather convenient, wouldn’t you say? In 1963, Zapata Petroleum merged with Southern Penn Oil to become Penzoil. However, the off-shore part of the company continued and expanded its reach to other areas around the world including the Persian Gulf. The company’s rigs were used as listening posts for the CIA both during The Bay of Pigs in 1961 and the Cuban Missile Crisis of the following year. The Bay of Pigs Invasion (also known as…no I’m not kidding…Operation Zapata) had been in planning before President Eisenhower left office. The plan was to do an early form of “regime change” on Fidel Castro, but make it look like it was an indigenous Cuban rebellion. President Kennedy tentatively signed off on the plan, but then failed to commit US air power to support the failing invasion. Many conservatives blamed Kennedy and called him weak on communism. The CIA plot was exposed and Bush ally and Zapata supporter Allen Dulles lost his job. Was Zapata being used as a CIA front company? Was George H.W. Bush a CIA asset long before he claims to have been involved and well-before the Kennedy Assassination? Did the Bay of Pigs provide a motive for murder by a group of people closely linked to people who had planned a coup 30 years earlier? Still not believing? The two transport ships used during the CIA operation during the Bay of Pigs were the Barbara J (Barbara Bush?) and Houston J (Zapata’ base of operations). Could this be another coincidence like the name Operation Zapata? As I mentioned in the previous article, George Herbert Walker Bush is one of probably one American over 10 who doesn’t know where he was the day JFK was shot. 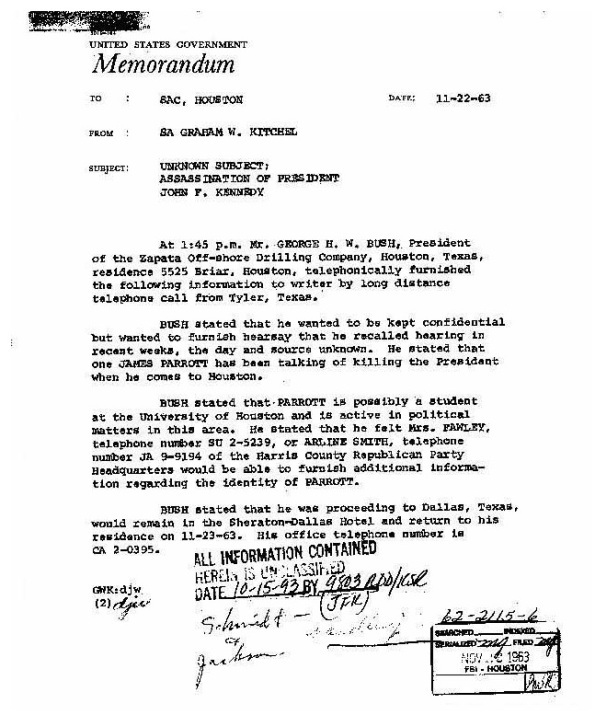 However, FBI documents report that he called in a tip that JFK might be in danger from Waco, TX the day of the assassination. Was this cover to establish a CIA operative’s whereabouts somewhere else that day? Bush denied he was part of the CIA that early. Yet, we know his companies platforms were used by the CIA. We know his father and family are connected to practically everyone involved in the formation of the CIA. Watch how this goes now. November 22, 1963 President John F. Kennedy is assassinated in Dallas, TX. His supposed assassin is gunned down two days later on national TV by a known CIA informant. After his 1964 conviction, Ruby’s attorney appealed his case. Ruby gave a press conference where he said the following. President Lyndon Johnson appoints Allen Dulles, the powerful disgraced CIA director from the Bay of Pigs Operation, to the Warren Commission along with Michigan Congressman Gerald R. Ford. The Warren Commission decides Lee Harvey Oswald was a crazed “lone gunman” and the CIA added the phrase “conspiracy theorist” to the media mantra for anyone who disagreed. Here is Dulles defending the Warren Commission Report in an interview. Within 10 years, Gerald Ford became the first man ever to become both Vice President and President without receiving a vote from a single voter. He names Nelson Rockefeller his Vice President (a family holding real power behind the scenes on many of the things I’ve discussed here) and George H.W. Bush as a supposed “outsider” as CIA Director. Many have noted the way Bush smiles when he mentions the Kennedy assassination during his eulogy of Gerald Ford. Then he proceeds to make the case that the Warren Commission is definitive because Gerald Ford put his name on it. Here the new CIA Director is interviewed by Mike Wallace and vigorously defends the agency and ends by saying there’s no political mileage in the job for him. Hmm. Four years later Bush becomes Reagan’s surprise vice-presidential running mate. Rumors have always circulated that Reagan was forced to choose Bush. Whether he was forced by party insiders who had supported Bush throughout the primaries against Reagan’s candidacy or by more nefarious outside forces, he was eventually convinced he had to pick Bush. Their animosity was public and well-known. Was Reagan being pragmatic or was his hand forced? in the following ABC News report, the reporter shares that Vice President Bush’s son, Neil, was set to have dinner that night with the attempted assassin’s brother. Huh? What happened to that story? Never saw the light of day. Was never talked about. Just like trading with the enemy was never talked about or the FDR coup, or maybe even the JFK assassination links. Why? I know. I’ve thrown a lot of mud up on the wall here. The question is why is a family with so much mud sitting around to be thrown about them so respected and beloved? It’s hard to understand, but if we want The United States to ever be the country we truly want it to be, we have to be willing to challenge our paradigms and have the courage to look behind the curtain. I believe every human being, beyond these forms, is a powerful worthy soul. People may read this article and see the smiling, grandfatherly figure in all the recent pictures and think I’m crazy. How could that guy and his family be involved in all these things? Every human has family, has those connections, feels loss. It doesn’t automatically mean the person is incapable of very negative things. Even Hitler and other top Nazis laughed and had their human moments. What we see and are told in the media is often a kind of spell…an illusion. We should be cautious in falling for it too easily.